Conveniently located just steps from the San Diego Convention Center, the Marriott Marquis San Diego Marina Hotel is a four-star hotel and a short walk to the best of downtown. The hotel is within walking distance to City Walk, the Gaslamp Quarter, Seaport Village and Petco Park. After exploring the area, relax in our spacious accommodations, all offering either scenic city or waterfront views. From the moment you arrive at the Marriott Marquis San Diego Marina hotel (just four miles from the San Diego International Airport), you’ll feel and observe the distinctive coastal culture that is uniquely San Diego and find yourself at the heart of all things SSO 2019. Make your reservation today to guarantee your spot. Rooms priced especially for SSO 2019 attendees are available on a first-come, first-served basis and will book quickly. 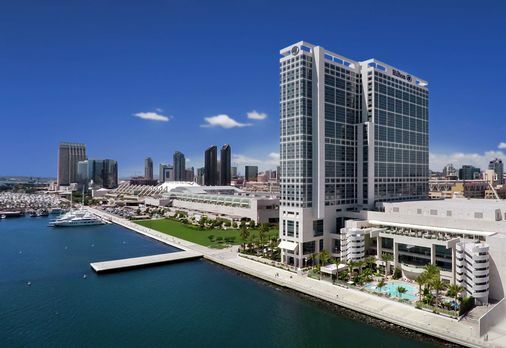 Conveniently located just steps from the San Diego Convention Center, the Hilton San Diego Bayfront—the official hotel for SSO 2019—is a sun and sea-inspired 30-story hotel with stunning views of both the city and the bay, relaxing leisure facilities and trendy dining venues. In addition, the Hilton San Diego Bayfront will be the site of the SSO 2019 Welcome Reception taking place Wednesday evening, March 27, bringing together the diverse audience of cancer care leaders from around the world to kick off the next three days of high-value education, collaboration and inspiration. From the moment you arrive at the Hilton San Diego Bayfront (just four miles from the San Diego International Airport), you’ll feel and observe the distinctive coastal culture that is uniquely San Diego and find yourself at the heart of all things SSO 2019. Make your reservation today to guarantee your spot. Rooms priced especially for SSO 2019 attendees are available on a first-come, first-served basis and will book quickly. Several non-official housing companies have been contacting SSO speakers, exhibitors and attendees claiming they can secure hotel rooms at designated SSO hotels in Dan Diego for the Annual Cancer Symposium. These companies are not authorized to represent SSO nor do they have access to officially contract SSO hotel room blocks or rates in San Diego. If you receive a call, please be aware that there have been reports from groups and individuals after paying these companies that no room was reserved, and they lost their money. Please do not make reservations through any unknown housing or travel company. The official hotel reservation or housing service company for SSO is SPARGO, Inc., 11208 Waples Mill Rd., Suite 112, Fairfax, Virginia 22030. Hotel reservations for the SSO Annual Cancer Symposium can be made online via the SSO 2019 website.